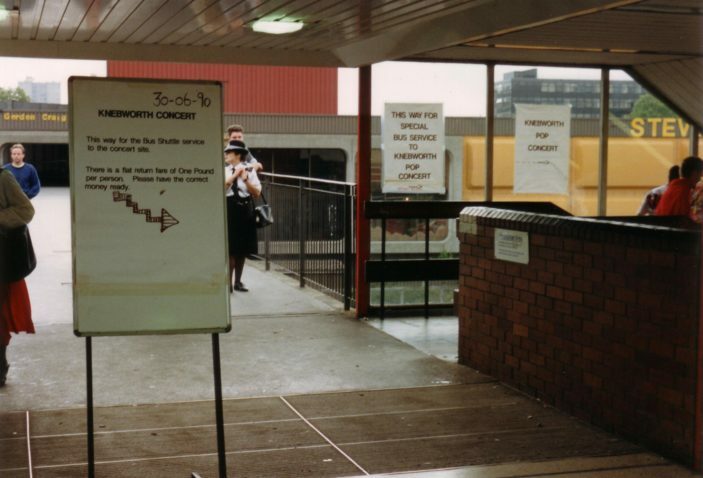 The sight which greeted fans arriving by train at Stevenage station. This was as near as I got to the concert myself! Were you there? Who was performing in July 1990? I was there with my brothers David & Barry. It was amazing. I was living in Toronto and I told my brother get tickets and I will be there. The phone call came and I flew over for 1 week, it worked well as Don Monk was retiring from Barclay school the following week so I got the concert and meet up with schoolfriends. Had to walk from Basils Rd to the grounds and home again, long day but will never forget it. I was there! The main things I can remember about the day are the walk from the station, the rain, & Cliff’s pink suit! According to http://www.knebworthhouse.com, the acts playing there in 1990 were Pink Floyd, Paul McCartney, Mark Knopfler, Eric Clapton, Elton John, Phil Collins and Genesis, Robert Plant and Jimmy Page, Cliff Richard and The Shadows, Status Quo, Tears for Fears.